DHL is one of the world’s leading logistics companies. The company operates in over 220 countries and territories around the world, providing various courier and mail services. 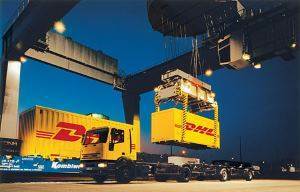 DHL offers various postal and logistics solutions through the company’s main divisions, including DHL Express, DHL Forwarding/Freight, DHL Supply Chain and Deutsche Post. DHL Express shipments may be tracked online. The online tool provides real-time information detailing the process of shipments as it moves through the DHL network. Tracking information is also available by contacting DHL Express Customer Service, although all information available from customer service agents is provided online. In order to track a shipment, a DHL Express Tracking Number is required. The online tool allows for the tracking of up to ten shipments at a time. The tracking system may only be used to track shipments tendered via DHL by or for the person requesting the tracking information. Other uses are only permitted with written consent from DHL. DHL ActiveTracing is an online tool available for checking the current status of consignments. A reference number, a DHL Order Code or Consignment ID, or a DHL Package ID or DHL License Plate may be used to track consignments. Consignment data is available for shipments made over the past six months. DHL ActiveTracing is also the name of DHL’s mobile application for iPhone, Android and BlackBerry devices. Alternative ways to track DHL shipments include DHL eTrack, DHL ExpressSMS and DHL SpeedTracking, which allow for the tracing of shipments by email, text or phone. DHL eTrack permits users to track up to 50 DHL Express shipments at one time using an email-enabled device, including mobile phones. Users simply send an email to track@dhl.com with waybill numbers and wait to receive a near-automatic reply with tracking information. DHL ExpressSMS is a similar service where users enter waybill numbers in a new message and send it to +44 7720 33 44 55 and receive details of the shipments by SMS. 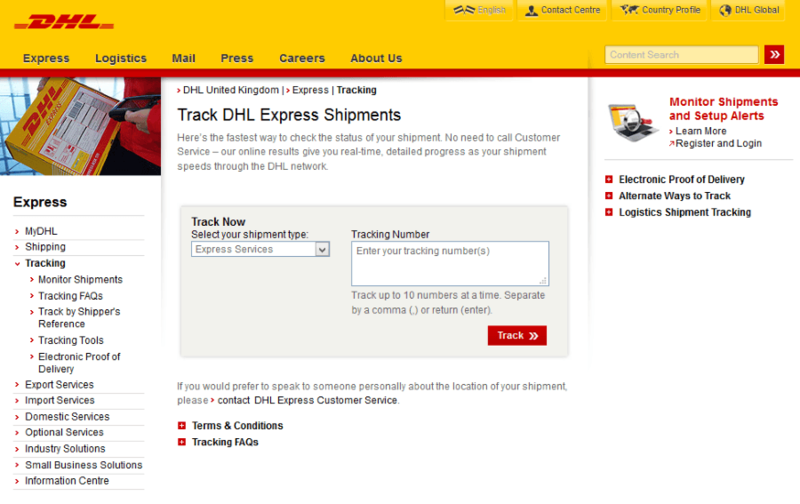 DHL SpeedTracking works by calling DHL Customer Service on 0844 248 0844 and saying “Track a Parcel” when promoted. Shipment information is available by saying or keying waybill numbers using the phone’s keypad. To track logistics shipments, DHL offers specialised freight tracking applications. To track air freight, a DHL House Airway Bill (HAWB), Reference Number or Master Airway Bill is required. A container number, Danmar Lines Bill of Lading, Ocean Carrier Bill of Lading or Reference Number can be used to track shipments sent by ocean freight. For road and rail freight, shipments may be tracked using an Order Code, Reference Number or Package ID. Other dedicated tracking tools are also available for DHL’s supply chain customers, including Supply Chain Agile and Supply Chain Log-Net. Supply Chain Agile is used for managing material flow from the shipper to the consignee, while Log-Net is an information management suite with reporting tools and proactive shipment management capability. Supply Chain Integrator provides important supply chain information, including transportation and supply chain event management capability. DHL was founded in San Francisco, California in 1969. DHL’s first operations involved shipping cargo documents between San Francisco and Honolulu by plane. The new service allowed for customs processing of a ship’s cargo to begin before the arrival of the shipment. DHL also pioneered international air express service with quick transport of documents and cargo papers. Each letter in the company’s name represents the initials of DHL’s original founders: Adrian Dalsey, Larry Hillblom and Robert Lynn. DHL expanded quickly in the 1970s with new operations along the Pacific Rim, including launching services in Japan, Hong Kong, Singapore and Australia in 1972 followed by Europe in 1974. The company launched operations in Latin America in 1977 and the Middle East and Africa in 1978. In 1979, DHL added parcel delivery to its services in addition to document delivery. In 1986, DHL became the first express company to operate in China following a joint venture with the Chinese government. A successor to Deutsche Reichspost, Deutsche Bundespost was formed in 1950 as a government agency responsible for national and international postal services and telecommunications. The agency also provided banking and other communications and transport services. In 1989, Deutsche Bundespost was divided into three new entities: Deutsche Bundespost Postdienst (operating as Deutsche Post), Deutsche Bundespost Postbank (operating as Postbank) and Deutsche Bundespost Telekom (operating as Deutsche Telekom). In 1990, the East German Deutsche Post was incorporated into Deutsche Bundespost. Deutsche Post AG was founded in 1995 following the introduction of the Posts and Telecommunications Reorganisation Act. The new legislation privatised Deutsche Post, Postbank and Deutsche Telekom and merged all operations under the new parent company. In 1998, Deutsche Post acquired a minority interest in DHL. In 2002, the two companies formerly merged. At the time of the merger, DHL Worldwide Express had more than 71,000 employees. In 2003, Deutsche Post bundled its express and logistics business under the DHL brand. Deutsche Post AG, operating as Deutsche Post DHL, is one of the world’s largest courier companies. Deutsche Post DHL operates under two brands: DHL and Deutsche Post. As Deutsche Post, the company provides mail and related services in Germany. The DHL brand is known for international express, logistics and mail services including customised solutions for businesses in various sectors. In 2013, Deutsche Post DHL generated revenues of over 55 billion euros and employed more than 435,000 employees worldwide. DHL Express is responsible for transporting and door-to-door delivery of urgent documents and goods around the world. Services range from express, courier and parcel shipments. DHL Express has a fleet of 250 aircraft, making it one of the largest airlines in the world. Based in Bonn, the division saw revenue of approximately 12.7 billion euros, served an estimated 2.7 million people and employed 93,000 people in 2013. It also operated a network of approximately 40,000 Service Points around the world DHL Express links over 500 airports globally and operates over 31,000 vehicles. The division is divided into regional business units, specifically Europe, Asia Pacific, Americas, and Europe, the Middle East and Africa. DHL Global Forwarding, a business unit of the company’s Forwarding/Freight Division, is responsible for a variety of logistics solutions, including standardised logistics operations, multi-modal transport solutions and customised industrial projects. The unit employed an estimated 32,000 and served more than 150 countries and territories in 2013. It also handled more than 3.9 million tons of air freight and over 2.8 TEUs in ocean freight (or twenty-foot equivalent units, an inexact unit of cargo used to measure ocean freight volume). DHL Global Forwarding operates about 850 branches globally. One of the leading road freight providers in Europe, DHL Freight provides LTL (less than truck load), FTL (full truck load) and intermodal transport services. A unit of the company’s Forwarding/Freight Division, DHL Freight’s main client group is companies in need of business-to-business (B2B) services. DHL Freight operates an extensive terminal network of more than 180 facilities and provides specialised services including customs handling, sector-specific freight solutions and logistics. In 2013, DHL Freight employed approximately 14,000 people and operated in more than 50 countries and territories. It also makes approximately 5 million FTL shipments each year. Employing more than 135,000 people in 2013, DHL Supply Chain operates 2,400 terminals, warehouses and offices and service customers in over 60 countries and territories. It also has an estimated 23 million square metres of storage space. DHL Supply Chain provides corporate information solutions and contract logistics, including warehousing, managed transport solutions and value-added services throughout a company’s supply chain. Solutions are customised for individual customers in a wide range of sectors. Deutsche Post is one of the largest postal service providers in Europe. The letter and parcel leaders served approximately 40.7 million households, 3.7 million business customers and 2 million retail outlet customers every day in 2013. Its network includes 82 mail centres, 33 parcel centres and over 26,000 retail outlets and points of sale. 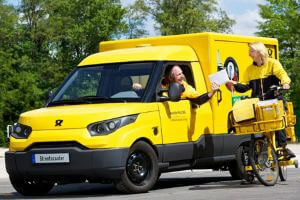 Deutsche Post handled an estimated 64 million letters and more than 3.4 million parcels every working day in 2013. It provides mail delivery service six days a week and has exclusive rights to deliver letters less than 50 grams in Germany. DHL Global Mail, a business unit of Deutsche Post, operates one of the world’s largest delivery networks. The division has more than 30 sales offices and over 25 processing centres around the world. In 2013, DHL Global Mail employed some 2,000 people and had a market value of approximately 6.7 billion euros. Deutsche Post also distributes newspapers and magazines through its Press Services unit, provides direct marketing services through its Dialogue Marketing unit and handles domestic and non-express parcels with Parcel Germany. DHL Express transports documents and parcels within the United Kingdom and around the world. DHL Express rates vary depending on the destination as well as the weight and dimensions of the document or parcel being shipped. Virtually any item can be sent with DHL express, although there are restrictions on certain items. Restricted items include antiques, works of art, bullion, cash, firearms, dangerous and hazardous goods, small electronic items with Lithium batteries, furs, ivory, human remains and ashes, illegal items and goods, live animals, tobacco, and other items. DHL Express offers domestic time-critical and time-sensitive options for delivery within the United Kingdom. Additional insurance and tracking options such as requiring a signature on delivery are available with DHL Domestic Express. All DHL Domestic Express service options include free shipping supplies including envelopes and boxes for shipments between 500 grams and 25 kilograms. Time-critical services include DHL Domestic Express 9:00 for guaranteed next possible working day delivery by 9:00 a.m. DHL Domestic Express 12:00 provides guaranteed next possible day delivery by noon. Both services are available from all UK post codes to major business locations in England, Wales, Scotland and Northern Ireland. Full money-back guarantees and proactive delivery notifications are provided free of change. Parcels up to 30 kilograms and shipments of up to 300 kilograms may be sent with the 9:00 service, while parcels of up to 70 kilograms and shipments of up to 300 kilograms may be sent with the 12:00 service. DHL Domestic Express is available for time-sensitive shipments with delivery by the end of the next possible day. DHL Express Easy and DHL Domestic Express Easy are also available for time-sensitive delivery at DHL Service Points for shipments of up to 70 kilograms. DHL Domestic Express is available from and to all collection and delivery locations in the United Kingdom. Door-to-door pick and delivery is available for documents and parcels weighing up to 70 kilograms and shipments of up to 300 kilograms. Other options are also available for heavyweight parcels. There are a number of options for sending documents and parcels outside of the United Kingdom. Shipping options range from same day services for emergency shipments and time-definite delivery for less urgent shipments. Senders may determine terms of trade, including deciding who will pay for transport, duties and taxes for shipments. Same Day options are available for emergency shipments 24-hour a day and 365 days a year for parcels of up to 70 kilograms. Door-to-door delivery is within the shortest possible time. Pick-up is generally within 60 minutes of booking and delivery is within the same day the item is sent or within 24 hours, depending on the time of booking and the destination. Options include DHL Jetline for emergency next flight out service to any destination around the world. This service is ideal for business-to-business shipping needs. 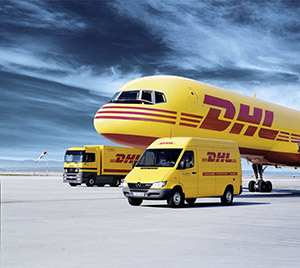 DHL Sprintline provides emergency van or truck delivery, while DHL Secureline is available for door-to-door delivery via secure flights with an onboard courier or charter aircraft, depending on the shipment. DHL Secureline is designed especially for high-value shipments. DHL Express also offers time and day definite international delivery. DHL Express 9:00 guarantees delivery by 9:00 a.m. on the next possible business day, while other options guarantee delivery by 10:30 a.m. (DHL Express 10:30) or noon (DHL Express 12:00) on the next possible day to major business areas. Delivery times outside of major business areas may be longer. DHL Express 9:00 is designed for low value shipments and pieces of up to 30 kilograms, while DHL Express 12:00 is available for pieces weighting up to 70 kilograms and shipments of up to 300 kilograms. DHL Express Worldwide provides delivery by the end of the next business day, while DHL Express Easy is a similar option offered at DHL Service Points for time-definite delivery worldwide. 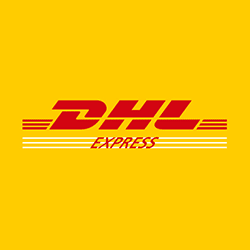 DHL Express Worldwide is available for shipments of up to 300 kilograms and individual pieces of up to 70 kilograms. Less urgent items may be sent with DHL Economy Select. DHL Economy Select is available for door-to-door delivery of single or multi-piece shipments and pallets. Collection can also be made from DHL facilities around the world. 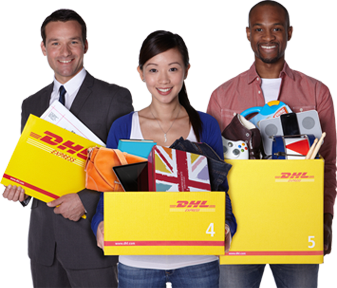 DHL Global Mail provides collection and processing services for non-sorted, non-franked correspondence. DHL collects international business mail that is then delivered through the postal networks of destination countries. Options include Priority and Standard delivery. Collection is made by DHL Express couriers and all correspondence is sorted and stamped at a DHL mailing house in the UK. Items are tracked until they enter national postal networks of destination countries. DHL Global Mail is available for sending business and personal correspondence. The option is a cost-effective solution when compared to sending regular mail, especially when sending bulk correspondence or multiple items at one time. It is also used for sending low value goods up to a maximum weight of two kilograms. Correspondence is prepared and addressed like other international mail items. Unsorted mail is then inserted in packaging provided by DHL and a DHL waybill is prepared before the item is collected by a DHL Express courier. Delivery times are between two to five days for Western Europe and three to seven days for the rest of Europe. Delivery to destinations in the United States and Canada is between three and six days, while delivery to addresses in the rest of the world is three to eight days. Transit times to more remote locations can be longer and will vary depending on individual postal networks in destination countries. As of 2014, DHL Global Mail rates range from £0.50 per item (£14.00 per kilogram) for letters and £1.00 per item (£6.50 per kilogram) for packets sent within Europe as of 2014. For the rest of the world, rates are £0.60 per item (£19.00 per kilogram) for letters and £1.30 per item (£9.00 per kilogram) for packets. Documents and parcels sent with DHL may be dropped off or picked up at DHL Service Points. There are more than 1,200 Service Points located across the United Kingdom, including branches at Staples, WHSmith, Homepase, Safestore, Ryman, Access Self Storage and hundreds of independent stores. DHL Service Points operate with convenient extended hours, as well as on Saturdays and Sundays. The maximum weight for parcels sent with DHL Express at Service Points is 70 kilograms per parcel. Dimensions cannot exceed 120 by 80 by 80 centimetres. Quotes for shipments exceeding these dimensions are available online or by contacting DHL Customer Service. Pricing at DHL Service Points are based on seven free DHL envelope and box sizes. As of 2014, rates for sending an envelope (27.5 by 35 by centimetre) weighing up to 0.5 kilograms is £6.95 for delivery within the UK, £24.95 for within the European Union, £26.95 for non-EU destinations, £29.95 for destinations in North America and £36.95 for the rest of the world. Rates for parcel shipments start at £12.95 for delivery within the UK, £32.95 within the EU, £33.95 within the rest of Europe, £34.95 for North America and £51.95 for the rest of the world. The exact price will depend on the weight and destination of the parcel. Delivery within the UK is within one to two business days, while delivery in Europe is within one to three business days. Delivery to destinations in North America (that is, Canada, Mexico and the United States) range from one to four working days, while delivery to the rest of the world is generally within five working days. In addition to DHL Service Points, shipments may be sent by booking a collection online with DHLitNow or by calling DHL Customer Service at 0844 248 0828 (Monday to Friday 7:30 a.m. to 10:00 p.m. and 8:00 a.m. to 4:00 p.m. on Saturday). No account or registration is required in order to send a shipment with DHL Service Points or DHLitNow. Collections can be made at a home or business address, and may be booked up to five days in advance when arranging collections online and up to seven days for bookings by phone. To find a DHL Service Point, visit parcel.dhl.co.uk. MyDHL is an online tool with shipping, tracking and importing services for DHL Express customers. The tool allows customers to customise information and preferences to ship, track, import and more. MyDHL is designed for occasional shippers, small and medium businesses who ship regularly, and large volume business-to-business shippers. The online application also allows users to consolidate various accounts under one online portal, including DHL ProView and DHL Online Shipping. Simply register with MyDHL or request for more information. DHL Redelivery allows recipients of shipments sent with DHL to arrange a new delivery option. Redelivery options include delivery to the original address or to a different address, such as a neighbour’s home. Other options include opting to collect the shipment from a DHL Service Point. In order to arrange a redelivery, a 10 digital waybill number is required. This number is on the notice card left by a DHL courier following the first attempted delivery. DHL offers a variety of web-based tools to track and trace shipments, including DHL IntraShip and DHL ProView. The company also offers a mobile application or app to allow customers to track shipments using a mobile device, such as an iPhone or Android phone. These tools may also be used to easily access a variety of other information, including address books. DHL IntraShip is a web-based tool that allows users to process shipments from a single or multiple locations. The online application allows users to share key data, including an address book, shipper and receiver lists, and historical data on packages sent with DHL. DHL IntraShip also permits users to create a shipment, download shipping documents, schedule pick-up requests and track shipments. 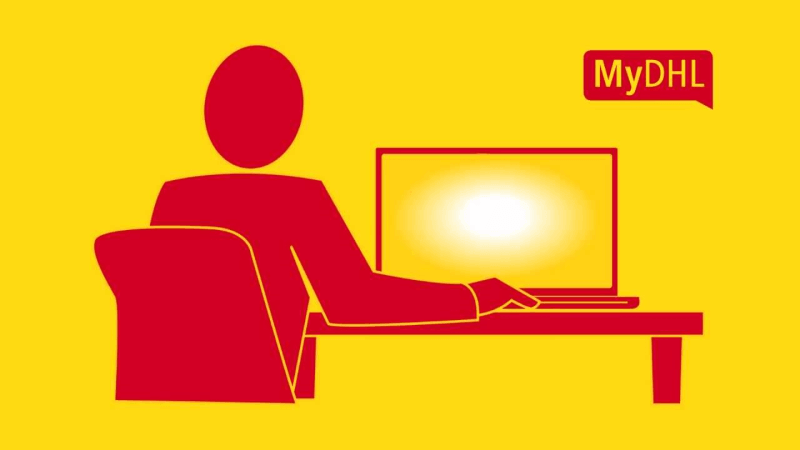 DHL ProView is a web-based, real-time tracking service for DHL Express account holders. The application provides automatic notifications to account holders, as well as other individuals who have been identified. Notifications letting users know when a shipment is picked up and delivered as well as other status updates are provided by email or text. DHL ProView can be used to view or download shipment and status information on up to 2,000 account numbers. To register with DHL ProView, users must have a DHL account number and contact a local DHL account manager. For more information on DHL ProView, visit proview.dhl.com. DHL ActiveTracing, the company’s mobile application, allows users to quickly track shipments. The mobile app is capable of scanning shipment bar codes using mobile device cameras rather than key in tracking numbers. Users are also able to set up a favourites list to organise shipment information and add aliases to better identify shipments, as well as send links on shipment statuses by email. DHL ActiveTracing is available for Android, iPhone and BlackBerry devices. DHL offers a variety of employment opportunities in operations and support, as well as for management and professionals. The company also runs a student scheme with work experience opportunities, as well as a graduate recruitment scheme for entry-level professional development through the DHL Graduate Programme, the GROW Programme and internships. Training is provided on-site or through the company’s online learning portal. Ongoing training and professional development is also offered, including dedicated leadership and management training schemes for management and professionals. Positions with DHL are based in service centres, DHL offices, airports, seaports, warehouses and other locations. Operations and support positions are involved in the day-to-day operations of DHL, as well as providing support services. DHL operations and support employees include pilots, flight crew, customer service agents, drivers and couriers, warehouse staff, package handlers and administrative staff. Management and professional positions are available in a range of function areas, such as logistics, IT and management consulting, banking and financial services, human resources, marketing and advertising, public relations, legal, product and project management, real estate facility management, transportation and network planning. DHL Express’s head office in the United Kingdom is located at Orbital Park, 178-188 Great South West Road, Hounslow, Middlesex, TW4 6JS. Alternatively, contact DHL Express on +44 (0) 844 248 0844 or by using the division’s online contact form. DHL Global Forwarding’s UK office is located at Danzas House, Kestrel Way, Dawley Park, Hayes, Middlesex, UB1 9HJ. Alternatively, contact the division by using the DHL Global Forwarding online contact form. Contact DHL Freight on +44 (0) 843 357 000 or use the company’s online contact form. DHL Freight’s main office in the United Kingdom is located at Terminal 2, Manchester International Freight Terminal, Westinghouse Road, Trafford Park, Manchester, M17 1DP. DHL Supply Chain is based in the UK at Solstice House, 251 Midsummer Boulevard, Milton Keynes MK9 1EQ. The division may also be reached by telephone on +44 (0) 8444 771100 or by completing DHL Supply Chain’s online contact form. To reach DHL Global Mail in the United Kingdom, complete the division’s online contact form. DHL Global Mail’s UK head office is located at Ocean House, The Ring, Bracknell, RG12 1AN. For all DHL contact information, visit DHL’s online Contact Centre. Richard Garratt. mobile number, 07919 982 448 please text to confirm message.